Welcome to the website of the company Eurodata! In the time of quickly evolving technologies to which belongs the Internet, every person needs to think how to keep up with the time. With the emergence of Internet in Latvia we after our own experiences made sure of the perspective of conducting a business by using the Internet, learned to do it professionally ourselves and will be glad to offer You a professional help. Because many of Your concurrents already have their own website and they are using successfully all the options of the technology of Internet. Today the best way how to let people know about Yourself and that does not ask big expenses for different variants of information advancement, is creating a website. Have You decided to create a website? Then You have come to the right address. You probably have many questions: which website to make – static or dynamic (manageable)? How to create a website? What should the design be like? How to plan the expenses? How to manage a website? Which CMS to choose? Where to dispose (hosting) the website? We can answer all the questions in connection with the production, creation and maintenance of a website. 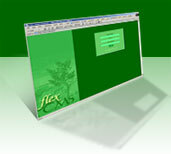 FleksCMS ™ - elastic and universal system for creating and managing any information of a modern Internet website. For managing system CMS no professional knowledge in necessary. You need a website? Not just a website, but a whole Internet-portal? Especially for You we will make a portal of any complexity! The company Eurodata offers a reliable, qualitative hosting for Your website and its registration on the Internet network, giving it any (after your choice) name of domain. The advantages of on-line systems are indisputable. We can develop especially for You a system for processing and delivering any kinds of reports - for accounting, financial, statistic data or any other information.